The bladder is a hollow balloon-shaped organ, located in the pelvis, that stores urine until ready for release. Urine is produced in the kidneys and flows into the bladder through tubes called ureters. The bladder is mostly composed of muscle, which aids urination by contracting to force the urine out. 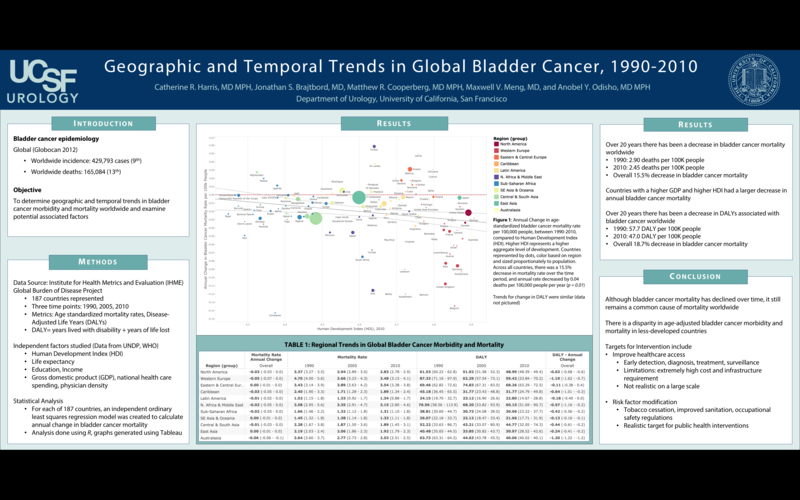 The incidence of bladder cancer is related to age and environmental factors. It occurs nearly three times more often in men than in women. The primary risk factor for developing bladder cancer is smoking, but others include chronic infections/inflammation of the bladder, and certain occupational and chemical exposures (e.g. aniline dyes, dye workers, textile workers). The most common symptom of bladder cancer is blood in the urine, which is usually not accompanied by pain. Other symptoms may include an increased frequency of urination, an urgency to urinate, and painful urination. If you have one or more of these symptoms, it does not mean that you have bladder cancer. However, it is important to see your doctor so that if you have an illness, it can be diagnosed and treated appropriately. In order to diagnose bladder cancer, your physician may order several tests. A urine test to look for microscopic cancer cells (i.e. urine cytology) should be obtained. Additionally, blood in the urine can come from anywhere in the urinary system (bladder, kidneys, ureters), so a radiologic test called a CT urogram focusing on the urinary tract may be useful. The urologist’s most important diagnostic tool is cystoscopy, which is a procedure that allows direct viewing of the inside of the bladder. If a tumor is noted inside the bladder, the initial treatment is surgical removal of the tumor under general anesthesia with an instrument similar to a cystoscope. This allows a pathologic diagnosis and staging of the tumor. The stage of bladder cancer is based on how deeply the tumor has penetrated the wall of the bladder. Further therapy, if any, depends on this staging and how deeply the tumor has penetrated the bladder wall.